Anita tries to make sense of a befuddling world through poetry. She began writing three years ago at the suggestion of a friend. 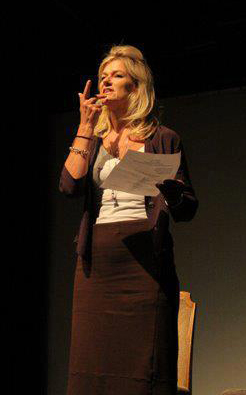 With the late Miles Hughes and a big team of helpers, and wanting spoken word to figure as entertainment more visibly, Anita created and managed Spit.It.Out Spoken Word Events, which premiered at the Auckland Fringe Festival the summer of 2012/13. Over 90 writers from Auckland and beyond shared their writing at 30 free gigs across seven venues, and Spit won a Special Fringe Award. Last summer a series of four Spit.It.Outs brought large and enthusiastic audiences to four Auckland libraries. She created and MCs Inside.Out Open Mic for Writers, a platform for writers of any genre and experience to read aloud and socialise. Her poem ‘Bringing Him Home’ was placed second in the Kevin Ireland Poetry Competition 2013 and has been included in the Poetry NZ Yearbook 2014. Donna Dean sifts through remnants of a self proclaimed co-dependent, self-flagellating youth in search of what might be a lyric. Songwriting and performance is her way of unravelling, examining and bringing clarity which shifts and uplifts not only the artist but her audience who all too often, recognize themselves in her songs. Her voice has been described as “aching, haunted, clear and determined” with reviews suggesting a likeness to American artists Carrie Newcomer, Cindy Bullens and Mary Chapin Carpenter. Donna is a recording artist with 7 albums, several EPs and singles. More than two decades of performance, including mutiple tours of Europe and recently the Southwest USA, helped hone her perfomance skills. Her songwriting is described by critics as “real”, “honest” and “masterful” with references made to Joni Mitchell, Bob Dylan and Leonard Cohen.